Some could ask, why would the National Museum of American History exhibit photographs of the Nixon administration  images that stir memories of hearings and Watergate  at this moment not so far removed from the impeachment of President Clinton. Our purpose is neither to embarrass anyone nor prolong the current debates. 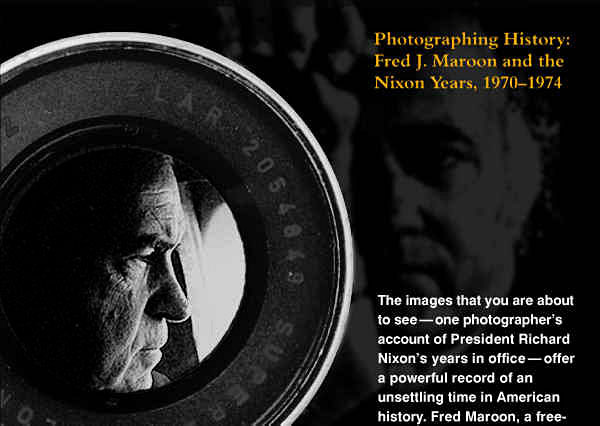 More than two years ago, the Museum decided that the coinciding of the twenty-fifth anniversary of the Nixon resignation and the acquisition of the Nixon-era photographs of Fred J. Maroon provided an opportunity to examine the role of photojournalism in a difficult, yet important, period of American political history. History museums interpret difficult, unpleasant, or controversial episodes, not out of any desire to criticize, be unpatriotic, or cause pain, but out of a responsibility to convey a fuller, more complex history. By examining incidents ripe with complexities and ambiguities, museums hope to stimulate greater understanding of the historical forces and choices that have shaped America.